The House Democrats have assigned Rep. Alexandria Ocasio-Cortez, who advocates a 70-percent marginal tax rate, to serve on the House Financial Services Committee. The committee oversees banks, insurance, international finance and credit. On her twitter account today, Ocasio-Cortez has put out multiple message celebrating her assignment. “I can’t stress how important this moment is,” she said in another Tweet. Yesterday, Ocasio-Cortez sent a tweet in response to former Gov. Scott Walker (R.-Wisc.) who had sent out a Tweet critical of excessive tax rates. 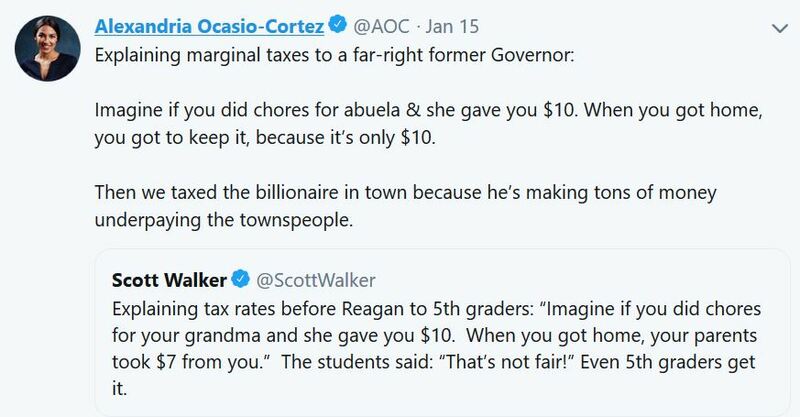 “Imagine if you did chores for abuela & she gave you $10,” said Ocasio-Cortez. “When you got home, you got to keep it, because it’s only $10. “Then we taxed the billionaire in town because he’s making tons of money underpaying the townspeople,” she said.